Read The Anchor, the diocesan newspaper since 1957. The arms of the Fall River Diocese, designed by heraldist Pierre de Chaignon la Rose, is comprised of a shield with its charges or symbols, surmounted by a bishop’s mitre. The shield is a silver field on which is displayed a blue bend (the diagonal line) of wavy lines, the heraldic equivalent of water. 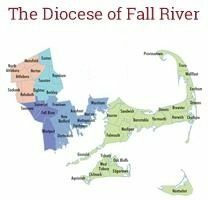 The falling bend, going from upper left to lower right, conveys the conception of “Fall River,” the title of the diocese. A red cross, symbolizing redemption and the graces which flow from the cathedral as the spiritual center of the diocese, is placed over the wavy bend. At the center of the cross a circle is incorporated in which sits a six pointed silver star to honor the Assumption of the Blessed Virgin Mary, the title of the Cathedral. Our Lady is called “Morning Star” in the Litany of Loreto. Ecclesiastical coats of arms are based upon heraldic laws and traditions and are governed by regulations issued by the Vatican Secretariat of State.